Stamporama: Sometimes, it's what's inside that counts! Sometimes, it's what's inside that counts! Sometimes a non-descript cover can hold vast historical treasure inside, just waiting for whoever takes the time to read it. This cover was found for C$10 (US$7.50) in a dealer's box at a recent stamp show. The cover is addressed to "Cornelia M. Huston" and postmarked "MEMPHIS / Te. / MAR 6" (Memphis Tennessee, March 6 ). The year is not included in most datestamps of this period, but is readily apparent from the dateline inside the cover. 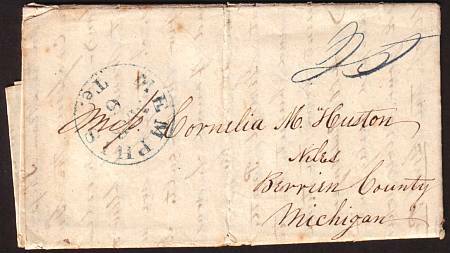 The blue manuscript "20" (cents) is the postage rate paid in advance for delivery to Niles Michigan, an old established community on the banks of the St. Joseph River in Michigan, just east of Lake Michigan. I will give you a short history of my travel. and was told a man was shot in the street. that was the fashion there. Every body went armed. went on until we arrived at Ceder lake in Brazora Co.
and one of our company died on the 15th August. a long fit of sickness and was well taken care of. started for N. Orleans in the Steam Ship Neptune Oct 27th. and sunk in 10 moments from the time she took fire. another earthquake though not so severe as the first. her to school & I will pay you when I come home. will answer your letter when you write. (inside edge) I did not find A. Huston. A full size scan of the first page of the letter may be seen here.